Well it's Monday again, man does the weekend fly. I really wish it would slow down. Here's today's project using the matchbox die that is coming soon. I just got Sweet Always designer paper and couldn't wait to try it out. 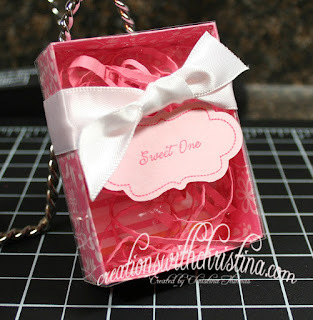 I used the matchbox die, Sweet Always DSP, Pink Pirouette Cardstock, Whisper White Satin Ribbon, Regal Rose Ink and Cardstock, Matchbox Messages Stamp set, and a piece of transparency paper for the outside of the box. (note because the transparency paper that I use is to thick I had to do the score lines by hand).